So far for 2019, every single breakout from this watch list has produced measurable gains. Look at the charts of all 7 of our TrendLine BreakOuts – ISRG, NMIH, PKI, MASI, FIVN, QNST, SPLK and most recently SBUX. This weekend, I found 5 more stocks to add to the TrendLine SetUps WatchList. We now have a total of 9 stocks on this very timely watch list in this Sunday’s report. Learn more here. As far as Adobe’s fundamentals, they are solid with quarterly earnings comparisons increasing well above the +25% min for more than the past 8 quarters. Annual earnings have been advancing considerably each year since 2015 as well. The company is, of course, a leader in its group. All of the ranks are very high, except for the Acc/Dist Rank. This rank will improve if the stock properly breaks out with volume. Technically, shares have recently broken above their 50-day moving average and are now near their 200-day moving average and a downward trendline. A break above there (our TRIGGER PRICE) would be buyable. 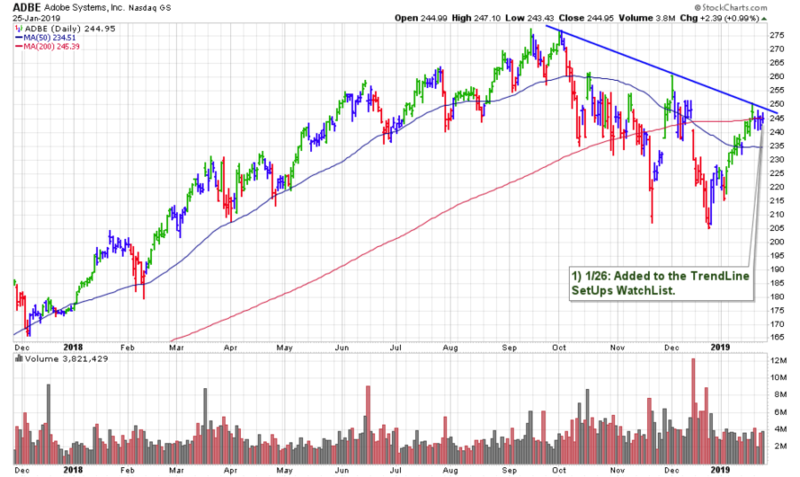 As is the case with all of our TrendLine BreakOuts – the stock does have some overhead supply to work through. This leaves some specific points of resistance to watch for. The first being the previous highs near $260. If shares were to confirm a BUY signal, $260 would be the 1st TARGET. This would also be an area to watch the stock closely to consider possibly taking some profits. Also of note, we are in the midst of another earnings season, where it can be tough to buy stocks properly as they breakout on earnings. ADBE reports off-season and not until min-March. A BUY in this area would give the stock a chance to possibly make some decent gains before it reports again two months. NOTE: Adobe is one of the latest additions to my TrendLine SetUps WatchList which will be featured in this week’s Sunday Stock Report. So far for 2019, every single breakout from this watch list has produced measurable gains. Learn more here.